No it’s just a clogged 3D printer nozzle, thanks for asking! 2017 seems to be my year for repairs on the Cocoon Create 3D printer, it was only a few months ago I wrote a big post about repairing and replacing the PTFE tube after it got seriously clogged. I did some research and found out exactly what the tube is for, and bought a roll of spare tube for future repairs (click here to read more). Lucky I did! This seems to be the same sort of problem, however instead of the PTFE tube just getting clogged, when I opened up the nozzle the tube had become melted and broke off inside, completely stuck as you can see in the photo. I wonder if the spare PTFE tube I had installed was made from dodgy materials, allowing it to melt? Or maybe the ABS filament had just found a way around the outside of the tube and caused it to clog. Either way it’s getting a bit frustrating to have the same issue. Luckily this wasn’t too difficult to fix (although I did jump straight on Ebay and buy a couple of spare brass nozzles – just search for RepRap MK10 0.4mm nozzle since the Cocoon Create is based on the RepRap Prusa i3). Using a drill and holding the nozzle with some pliers, I gradually worked my way up from a 2mm to 4mm diameter, clearing out the clogged material. 4mm is almost exactly the same as the internal nozzle diameter, so it cleared everything out nicely. After something like 150 hours of 3D printing leading up to Christmas it’s no wonder that my Cocoon Create decided to extend its holiday with some down time to kick off 2017. There have been 2 problems to do with extrusion that I’ve come across, and thought they might be handy to know how to fix for others with this printer, or indeed any of the many derivatives of the original RepRep Prusa i3 which this printer is based off. The top image shows the first problem which I noticed after some jamming and issues swapping out filaments – basically a build-up of filament “powder” over time from the gear grinding it when it’s been jammed. This one’s a nice easy fix, just a cleanup and a reminder to open up the extruder occasionally to keep things clean. If you’ve never opened the extruder before it’s nothing scary, just 2 bolts on the left where the fan is mounted to the heat-sink which opens the whole thing up as shown above. You might be surprised how simple the whole mechanism is. it stops heat from the nozzle climbing too high into the extruder and prematurely melting the filament, which would cause serious clogs. being non-stick, it helps the filament keep sliding smoothly down to the nozzle without sticking as it gets warm. A very cheap, simple part that has a lot of responsibility. Mine must’ve gotten worn out or slightly dislodged during my last attempt at fixing the extruder. Thankfully my printer came with 1 replacement, which I cut to size (make sure both ends are nice and square so that there are no gaps for filament to get caught in) and now I’m up and printing again with no problems. Also I’ve jumped onto Ebay and ordered a 2m length of PTFE tube (inside diameter 2mm, outside diameter 4mm) from China for $2.50 – I recommend anyone who has a 3D printer with this part order some PTFE tube as backup, it’s very cheap but if you need to buy something locally in a 3D printing emergency, prices look at least 10 times higher. For a couple of dollars it might just help keep you sane. I’ve previously written about another type of clog where filament breaks off inside the extrusion tube as you’re retracting it, and you can’t force a new piece in – check out the post here if this sounds like what you’re experiencing. Happy 3D printing, happy new year. It’s been a while since I last played with my 3Doodler Pen to repair a broken 3D print – the results were pretty cool, although it takes some practice to get reasonable results. Check out the post and images here. Some people make pretty amazing sculptures with the pen, however I find the real value in using the pen to fill gaps created by warped 3D prints and fix other cosmetic problems. One of my latest projects is assembled from 16 separate pieces printed on my Cocoon Create 3D printer (60 hours worth of printing! ), and inevitably with such large pieces printed using desktop FDM technology, there are some gaps caused by print warping. Most of them are reasonably small, but some like the ones shown above and below are quite large. Unfortunately the 3Doodler uses 3mm filament, meaning that I couldn’t use the same 1.75mm filament used to print the parts to begin with, but given that this project doesn’t need to be cosmetically pretty (prototype only), a different shade of yellow that came in the box will do. The first step is of course to use the pen to extrude material into the cavity, ensuring to move slowly and use the hot nozzle to bond the new plastic with the original. It can get a bit messy and smelly (do it in a well ventilated area – I had a fan blowing to keep a lot of the fumes moving away, but there were times my eyes were stinging), and as shown in image 2 above, might look a bit rough, but that’s OK. You can go back over some of the rough patches using the side of the hot nozzle to try and smooth them out, not extruding any material but using the nozzle like a hot rolling pin. This technique is also great for blending some of the sharp edges or smaller gaps that don’t really need to be filled. The final step is to use a metal file to clean things up, giving a much smoother finish. Admittedly this process wasn’t all smooth sailing, my 3Doodler kept getting clogged despite me taking it apart and cleaning it out – I have a feeling it might be the material quality and/or the temperature of the nozzle not being quite as hot as it needs to be, so a lot of time was wasted trying to manually push the filament through the pen and get a steady flow. I did notice that when I pushed the hot nozzle into my original print (the darker yellow plastic) it melted much quicker than the 3Doodler filament, despite them both being ABS. So material quality is likely the cause. But the final result is worth the pain, gaps are cleaned up nicely and the surface is nice and smooth. Time for some testing! With plenty of my designs available for you to download and make yourself on Thingiverse and Pinshape, this is officially the first product I’ve created through additive manufacturing for retail sale! My local surf shop, Surf Connect, approached me with a unique problem: popular Stand Up Paddle (SUP) brand Ozoboard uses a snap-fit locking mechanism to allow for adjustment of the paddle length, but many customers have been losing them into the ocean. While it seems securely locked with the snap details onto the paddle shaft, somehow people just keep knocking them off, I guess because it is close to where people may be gripping the paddle with their hands. This is the grey part pictured in the middle image on the left. A replacement part costs around $20 to buy, and to make things worse, the company making them is no longer able to supply them. So there are people stuck with paddles they can’t use because of this one small part. Well, as anyone who knows me would say, I’m up for any excuse to 3D print something new! Some digital calipers, some Solidworks CAD software, and an hour or so of time is all it took to reverse engineer the lock details. The only trick is the metal pin which has been moulded into the original part, and takes all the forces of the 2 paddle shafts when they are locked in place. To do this as simply as possible I just used a screw with a matching diameter (a M6 x 12mm in 316 stainless steel) as shown in the top left image, gluing this with Araldite into place and concealing with a little cap. Other than the extra bulge to accommodate this, the 2 parts are identical. I will now be supplying these to Surf Connect exclusively to sell, since there is a genuine demand for them and no other way for people to get them. As a keen kitesurfer (and now SUPer with one of these Ozoboard paddles), I can imagine how annoying it is to be stuck on land when it’s perfect summer weather! If you need one, please get in touch. You can also download the design from Pinshape by clicking here. It’s really no surprise that a new day printing with my new Solidoodle Press 3D printer has thrown up new challenges. Half way during a print I noticed that plastic had stopped coming out of the nozzle, and applying pressure to the filament from the top didn’t seem to help. Now one thing that is quite nice about the Press (as opposed to the many issues which I’ve found earlier) is that much of the nozzle can be opened with simple thumb screws. Finally, some forward thinking in terms of design! The first image above shows the cover removed, along with the front of the main body (no tools required). I had already retracted the filament, and found that indeed my guess was correct – a blockage in the nozzle (image 2). This was a nice easy fix, removed with tweezers when the nozzle was cool. What I didn’t expect was to find the extruder gear drive completely loose (the toothed part that feeds the filament down), to the point that I could pull it off the motor with the tweezers. Obviously this is the cause of my problems. After some searching on the always useful SoliForum, I found many people experiencing the same symptoms of filament not extruding, and a nice walk-through fix from Solidoodle Support. Basically the issue (which I’m sure will be a recurring one) is that the gear is held onto the motor shaft using an extremely small screw. 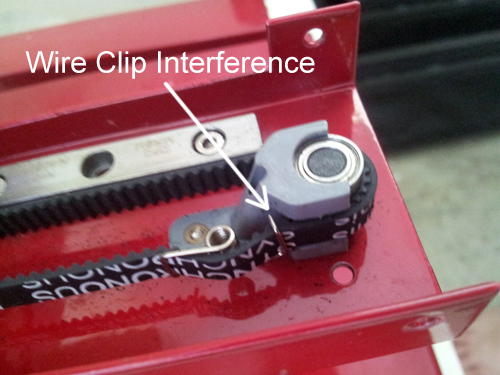 When this becomes loose, the motor will freely turn without engaging the gear, thus not moving the filament. Unfortunately you need an extremely small Allen key in order to securely tighten the gear in place, threading through a 1.5mm vent on the side of the housing – which I don’t have (and doesn’t sound overly safe with all the wires there!). However by taking the gear out, I could wedge a small screw driver into the hole and pre-tighten the screw, then push it onto the D-shaped shaft of the motor in the correct orientation. It’s the best I can do for now, time will tell how long it lasts before needing to be re-tightened. Hopefully the link to the Solidoodle Support page for this fix will help anyone who comes into this issues. A while ago I posted about some problems I was having with my Up! Plus 2 3D Printer slipping throughout some prints (read the post by clicking here including how I fixed the problem). Well the issue seems to be back as you can see in the first image above. The first slip was quite small, so I let the print continue, but when I checked on the print after about 4 hours I found this lovely mess with 2 more slips. UPDATE 16/01/2015: After taking a closer look at the mechanism, I noticed a small tension clip interfering with one end of the gears. It’s just an overhanging piece of the wire, but when the print plate moves to the very back position it begins to wrap around the gear and this small overhang hits an edge of the grey plastic pictured below. I have used needle-nose pliers to bend this arm down slightly so that it no longer collides. Hopefully this will help reduce any print errors as well as the clean/grease mentioned earlier.